Chef Amy Fortes used to dine on noodles with butter and everyone’s childhood favorite, the green container “shake cheese”. Now she’s more at home making dishes that land her a spot as one of South Carolina’s four chef ambassadors. In addition to running her mini culinary empire out of Fort Mill, SC and Rock Hill, SC (with a recent venture into Pineville, NC) Amy has been traveling the country, representing South Carolina in a variety of “key tourism and agricultural events” as part of the Chef Ambassador program (Press Release, South Carolina Department of Agriculture, 2016). 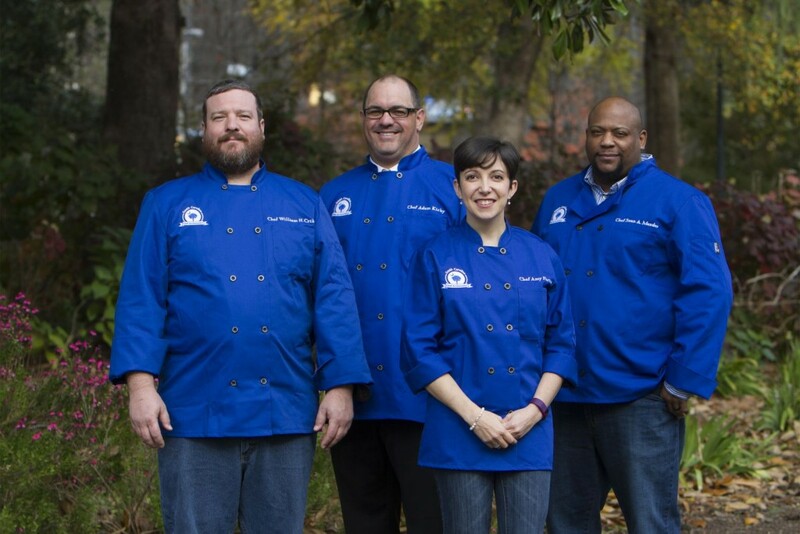 Started as an initiative of former SC governor, Nikki Haley, the program has been able to show off some of South Carolina’s culinary talent since it’s inaugural year in 2014. I met Amy as she passed out her dish at the Local Palate Destination Delicious event that opened this years Atlanta Food and Wine Festival. 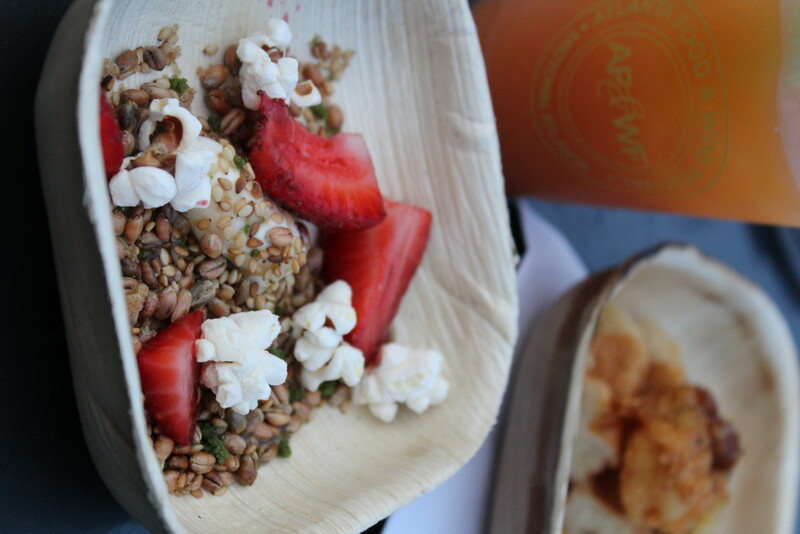 Bush-n-vine strawberries, Anson Mills popcorn, wheatberry “granola”, U.A.V. ricotta, and Fort Mill honey- ain’t no butter noodles anywhere in sight! You would think that with two successful restaurants and a catering company, plus being the one of only four chefs chosen out of the immense pool of culinary talent in South Carolina, Amy would be a little haughty. In our delightfully breezy phone interview I found her to be just the opposite. Maybe a little reserved at first, she came alive as soon as we started talking about her transition from old aspirations to her delve into the culinary world. With Johnson and Wales only accepting 18 of her two years worth of college credits, Chef Fortes had to almost start over when she switched her career path from trauma surgeon to chef. While I wrote and she hung by the pool with her kids, Amy talked about her aversion to bell peppers and cooked salmon (Smoked salmon is ok though. ), waxed poetic about a 5 gallon bucket of homemade blue cheese of which the quality is impossible to find in the South, and explained the key to being a good head chef. She emphasized taking things one step at a time, not stressing, and not screaming at your employees. Its amazing how so many chefs swear by berating as a form of motivation. As Amy stressed- most employees just shut down, stop learning, and are only able to think about the fact that they are being yelled at. Take notes from a pro, chefs all over. One of the most difficult things for Amy has been finding a work/life balance. With two step-sons and a little girl, a husband, and her career, Amy’s life is obviously hectic. She says things are finally slowing down, but I don’t see how. With her Pineville restaurant recently opened and plans to expand another existing restaurant (Pizza, anyone? ), Amy talks of two possible professional futures. One in which she grows the Flipside empire to 5 restaurants and one in which she downsizes to just 1 restaurant with “approachable food at a value”. Because she loves all of her restaurants for different reasons, our chef has yet to lean in any one direction with her decision. Weekend Amy (you know the one that gets to relax with her people and do her own thing) finds joy in making homemade pastas, especially ravioli for company and cooking with the people she is with. It seems the whole Fortes clan are cooks in their own right and they like to do it together. When the world lets Chef Fortes out of the kitchen, Amy loves to swim and hike with her kids, read, and dreams of the days when she used to ride her motorcycle. A Rock Hill girl myself, I am thrilled that Amy is one of our South Carolina Chef Ambassadors. May she continue to be innovative and creative without forgetting the girl who deep down loves butter noodles and “shake cheese”. Don’t miss a recipe- subscribe here!